We wanted to give you a few pictures of our evening stroll after dinner. We walked through the local neighborhood among lemon trees full of ripe fruit and beautiful colorful flowers down to the Aegean sea. This sea is known for its beautiful blue color. There are quaint coffee shops all along the shore. 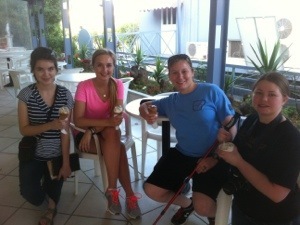 On our way back we treated everyone to fresh gelato. The Artemis that Harding owns is located in Porto Rafti. It is a resort town that many people from Athens frequent on the weekend or holiday. You’re welcome! I’m so glad we can. I have been in your shoes before and I remember how I felt. I loved getting news about the group! You are so welcome! We are having a great time! We appreciate your prayers. 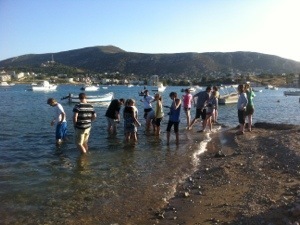 God is blessing this trip richly!